Behind every good picture, there is usually an equally interesting story to go with it. 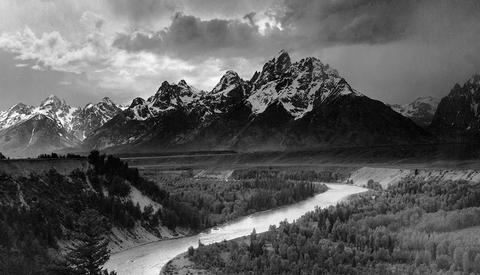 This world-famous shot by Ansel Adams is no exception and may just change how you think about landscape photography. The Ansel Adams Gallery has just released a video telling the wonderful story of how American landscape photographer Ansel Adams came to create one of his most famous and iconic images: "Moonrise Hernandez, New Mexico." The video shows how Adams changed the printing style and interpretation of the negative of this image over the years. Gravitating towards a much more dramatic and darker version later on. Adams claims this more contrasty direction was closer to how he originally visualized the scene at the time of making the image. Another interesting fact about the making of this iconic image was that Adams was unable to find his exposure meter at the time so had to take an educated guess on what exposure to use. If that wasn't enough, Adams made just one exposure of the scene as the light changed before he had the chance to make a second. While many of you are probably familiar with the image in this video you may not have known the back story or the evolution of its style. For me personally, it's videos like this that make me want to grab my camera and head outdoors. It also makes me appreciate how much harder our photography forefathers had it when it came to making pictures. There is so much more to the actual prints than you ever see in books or online, certainly more than I expected. I had viewed him as a technical master but the artistic came through in the prints. Worth searching out if you local museum has any on display. Oh I’ve seen his prints in person many times, and they are indeed extraordinary. Wasn’t sure if you felt seeing them in person would positively or negatively change ones perception on him. Now I understand! Ansel was a really good photographer, but he was a truly great printmaker. Oh wow, thanks for the info. Always thought that would be the case but you have inspired me to hunt his work down this weekend. Many thanks! 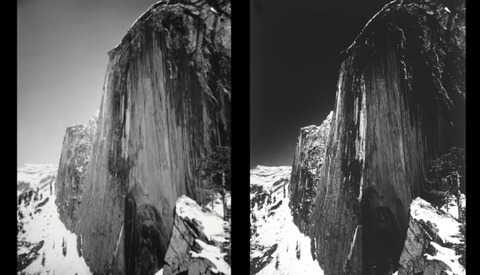 Not only should it change you perception of Ansel Adams, but it should change how you take pictures from now on. Why oh why did I not buy original Ansel prints when I had the chance? Don' feel like the Lone Ranger. We is all stoopid sometimes. I was offered a 16x20 print of 'Moonrise' in 1969 for $120. I was a sophomore in college and rarely had more than $20 in my pocket at any time. Reminds me of my f/64 days. Yes, and seeing those images in person is breathtaking and humbling. 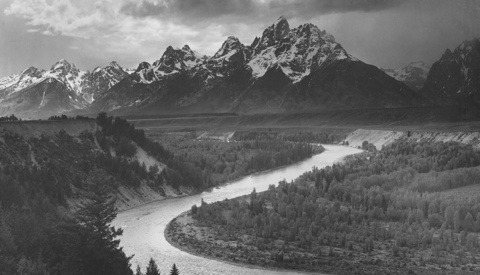 Although I think the word "iconic" is grossly overused, except when applied to Ansel Adams. Ever see Brett Weston's original prints? How about Irving Penn, Diane Arbus, Richard Avedon, Henri Cartier-Bresson. I considered including them in my comment, but this article was about Adams. If "iconic" were limited to such luminaries, it would not be overused. But you'll see that everything gets called "iconic" these days, once you start noticing it. I have read this story many times and I have seen the print in person. What really strikes me is that photography as we know it was still under development. He constantly changed chemicals and papers while he developed his printing style. How did he know that he should use several water baths of development? Think about it; he took this picture in the 1940s and didn't achieve a satisfactory print until the 1970s. In fact, in Adams later years, he spent more time in the dark room working on his old negatives than he did in the field. The big thing is that he got the exposure correct in the camera because of his knowledge of sensitometry. Today, we have all of these well developed tools that were not available to photographers in that era. They actually had to learn the nuances of the craft in order to make a print. Then, they labored for hours and even years in the darkroom to perfect the image. To me it is humbling. So humbling Ed, well said. The fact he was still working on the image 30 years later was not lost on me. That dedication is really inspiring to me. He died over 30 years ago, but yes, he was a master of black and white photography! My favourite of all his photos. Have always loved thinking about the rush he must have been in to set up. That moment when it all disappears and you're left with the hope you captured it. Also makes me think of his conversation with BBC about the actual idea of what a moment is, perhaps its a millennia if you're a mountain, but just a flash if you're a person. Great tip thanks for the info! Great story! The one photo I saw in my teens that immediately made me want to be a photographer... magical.